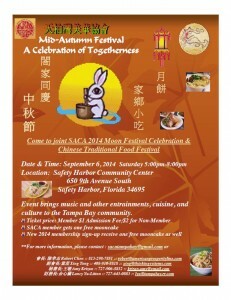 We are two weeks away from our traditional SACA (Suncoast Association of Chinese Americans) Moon Festival @ Safety Harbor. Please ensure to save the day!!! Please come and join us in our 2014 Mid Autumn Moon Festival this Saturday, Sept. 6, 2013, 5 pm – 8 pm. Safety Harbor Community Center, 650 9th Avenue South, Safety Harbor, Florida 34695. Member $1.00 Admission; None-Member $2.00 Admission. Please be sure to bring your membership card! 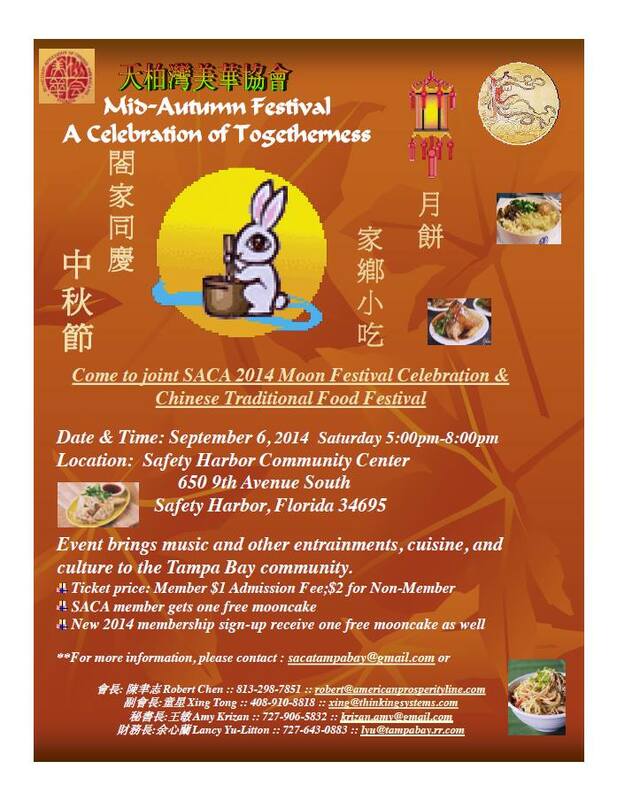 Each SACA member will receive a FREE MOON CAKE. Additional Moon Cakes can be purchased at the festival. As always, there will be many traditional Chinese performances, children’s games and great foods. We look forward to seeing you at the Moon Festival! — at Safety Harbor City Community Center.